These are my all-time favorite bran muffins. In addition to being incredibly yummy, the batter keeps in the refrigerator for up to 6 weeks! You can cook up a fresh batch in the morning…you can cook up only a couple or you can feed a crowd! The versatility works so well in my house. 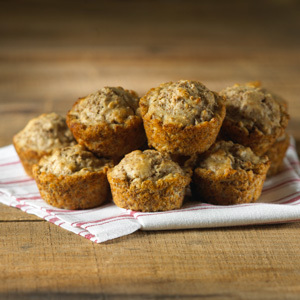 They may not be the “skinniest” recipe out there, but even my kids like these muffins! Also, you can do a lot of experimenting with the different kinds of bran cereal you use. A lot of times I mix more than two kinds to get the total amount I need…I have never had a bad batch! Sometimes I add some chopped apple to a batch…nuts to another…the options are endless! Sift together flour, baking soda and salt. Pour boiling water over whole bran cereal, set aside. Cream together sugar and shortening in a 6 quart bowl until light. Add eggs and beat well. Blend in buttermilk, bran buds and the whole bran cereal. Add sifted dry ingredients; mix well. Store in tightly covered container in refrigerator. Makes enough for 5 dozen muffins. To bake muffins: fill greased muffin pan cups 2/3 full of batter. Bake in 400 degree oven for about 20 minutes.